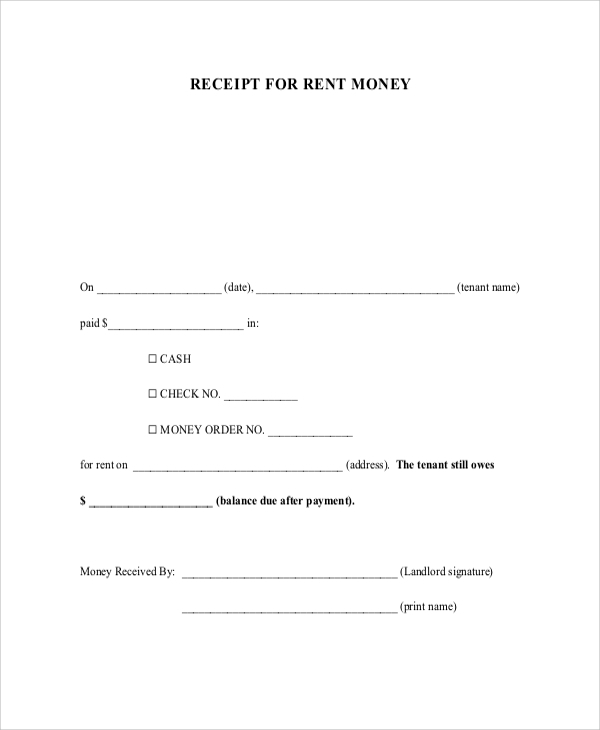 A rent receipt is a document issued by the landlord after making a rent payment. The receipt shows that the tenant has paid rent for a period of time. It acts as a contract agreement and it can be used in legal matters if there is a disagreement arising between the two parties i.e. the landlord and the tenant. To come up with a rent receipt, sometimes it can be quite hard and having a sample will ensure that you have a complete receipt. 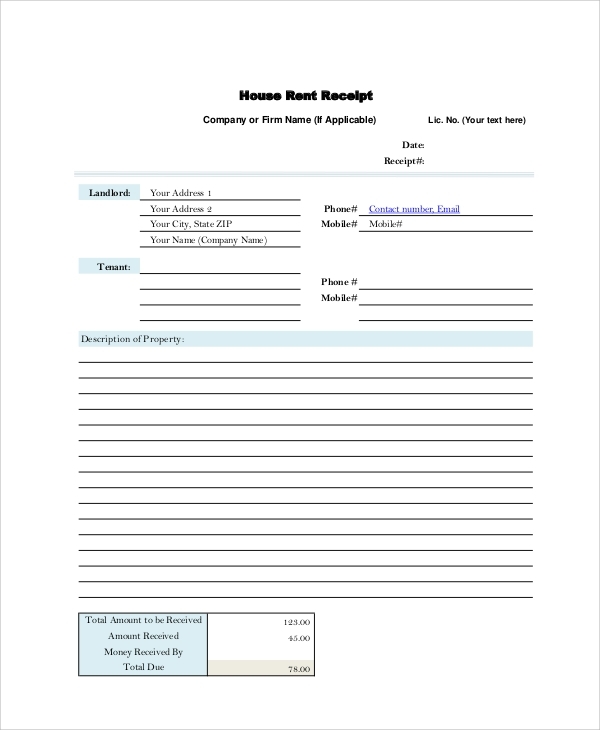 On this post, we have reviewed some of the Rent Receipt Samples available on our site. This is a sample of a receipt the tenant receives after paying the rent. The sample can be downloaded by the landlord and can be used directly because it’s ready to use. The sample can also be customized to suit the needs of the landlord. The sample is free on our site. Whenever making income tax returns, a rent receipt is needed to avoid people being taxed twice. This receipt sample is prepared for those landlords who wants to provide a rent receipt that is usable whenever making the tax returns. The sample can be downloaded from our site for free and it is fully customizable. 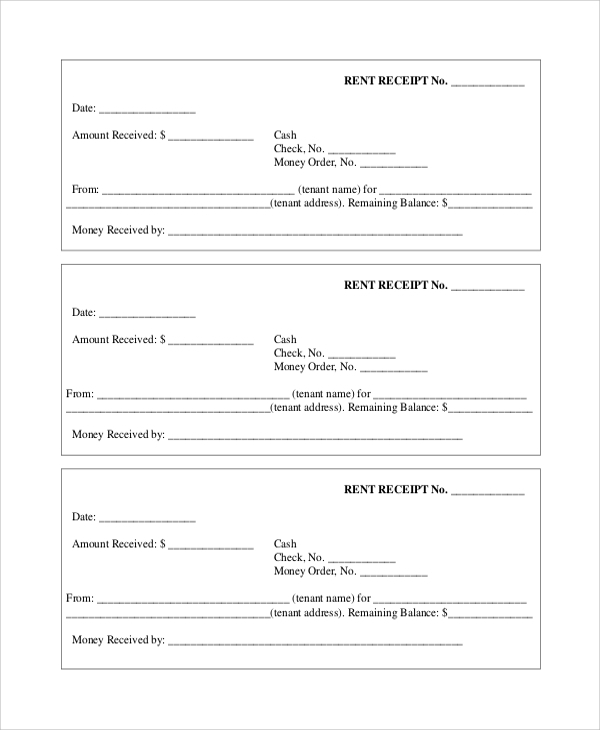 A rent deposit receipt is used by the landlord to issue to the tenants who have paid the rent deposit. The sample of the receipt is available for free download on our site and it can be easily customized to suit the needs of the landlord. What are the Benefits of a Rent Receipt? A rent receipt helps to protect tenants against bad landlords. Some landlords take advantage if a tenant has no receipt, they charge the rent twice or they fail to refund the deposit. Ensuring that you have paid the rent and gotten the receipt always is good for you since the landlord will not discriminate you for not paying the rent since you will have a proof that you can even use in the court of law if they claim you have not paid the rent. A rent receipt also ensures that you maintain a clean rent history, every receipt you have been issued with should always be kept safe. Who Needs a Rent Receipt? 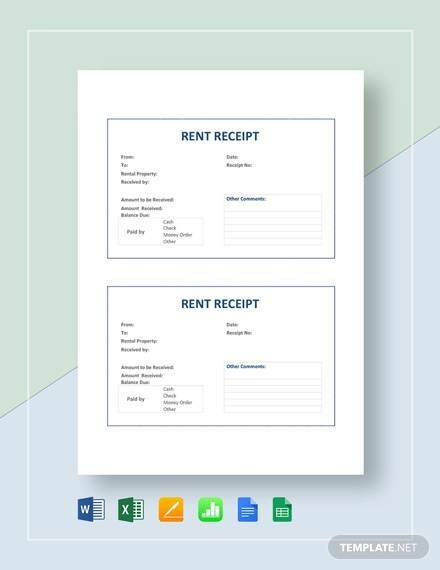 A rent receipt is needed by both the parties i.e. the tenant and the landlord. 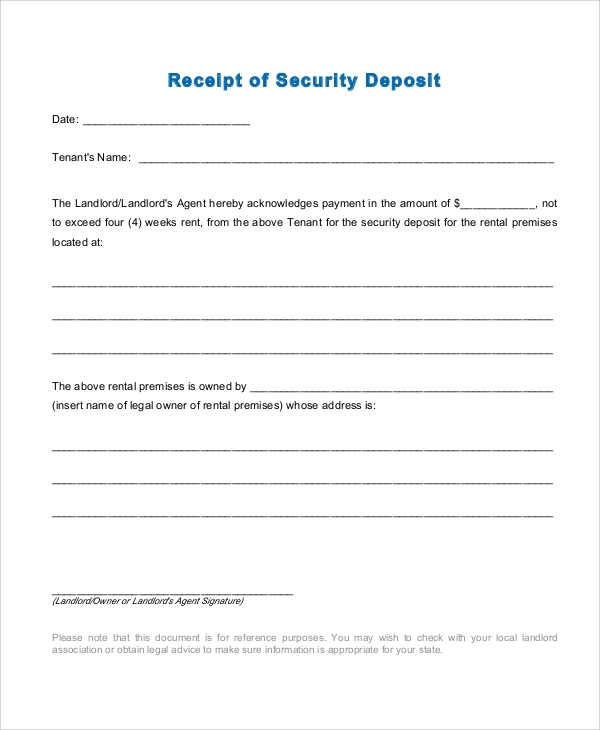 The tenants require the rent receipt in order for them to protect themselves from bad landlords who may come to ask for rent even after you have paid them with the rent. The landlords need the rent receipt to avoid quarrels that may arise if a tenant claims they have paid the rent. With a receipt, none of the parties can be discriminated and this makes both parties need the rent receipt equally. Without the receipt, there could be disagreements and quarrels. Where is the Rental Receipt Needed? 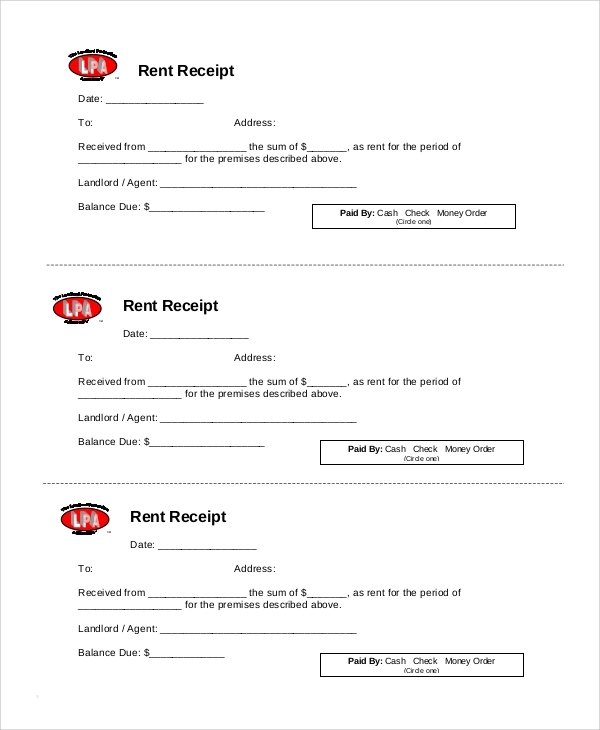 The rental receipt is needed whenever one wants a proof that they have paid for rent or they have a clean rent history. 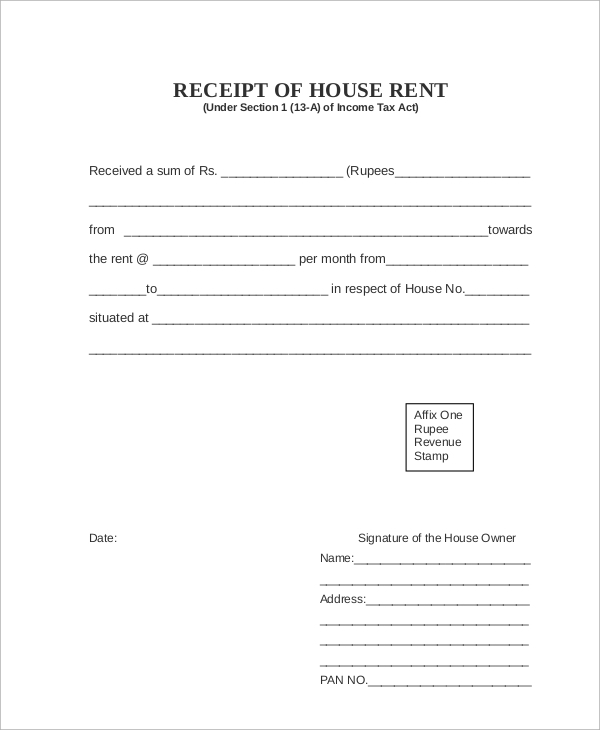 The receipt can be used in legal matters to show that you have already paid the house rent and this can save you from being commanded to pay the rent twice because you already have a proof. Landlords can use the receipts when filing tax returns and they may guide him to pay the right amount instead of making estimations. The rental receipt is a very important document. It is recommended for tenants to always collect the receipt after making any rent payment. 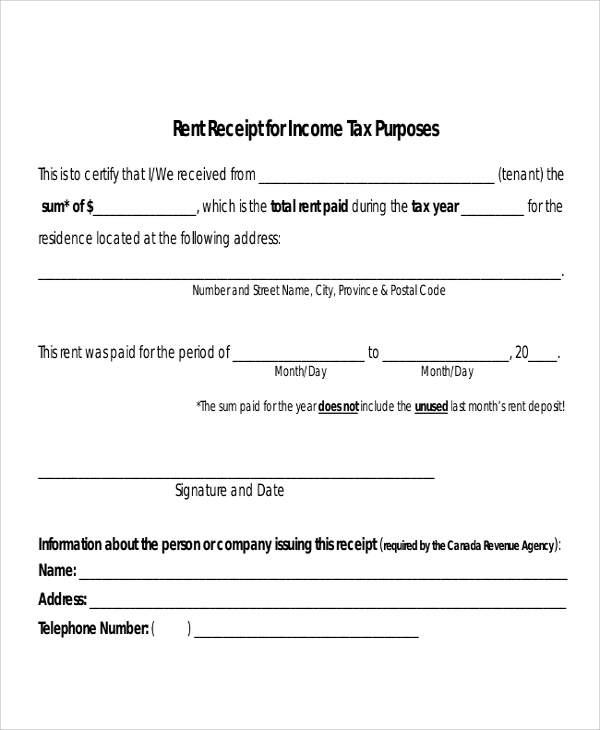 The rent receipt is needed as a proof that you have paid rent and have no prior rental arrears.You can also check Sample Sales Receipts.